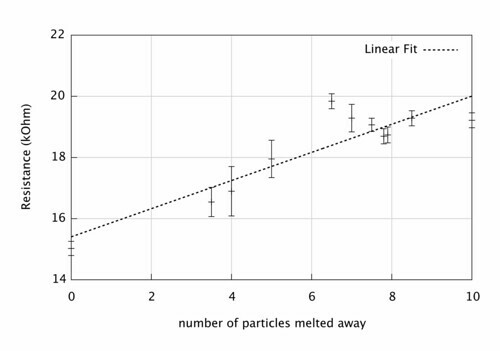 This is a plot of the sintering process, resistance as function of melted particles. The resistance is shown to go up during the process. It's hard to say anything more about the behavior of the system. But at least due to the resistance increase, some of the current appears to go through the particles, not to surprising perhaps. The final resistance is on the other hand quite low meaning that good conduction still exist after the particles melted away.